A tolerant, plasticised puff pastry fat. The fat is based on a blend of selectively hydrogenated edible oils, which have been fully refined and deoderised. Conforms to both the Muslim and Jewish authority food standards. 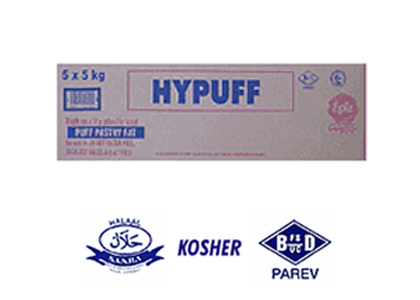 Hypuff has been specially formulated for hot conditions and industrial machine applications, especially where the Scotch method is used. The ideal fat for all hot oven pies, sausage rolls and pastries. 25kg corrugated board container, in unique individually wrapped 5x5kg bricks, sliced in 1kg slices for ease of use and accurate scaling. The product contains BHA antioxidant, in accordance with South African legislation. Conforms to both the Jewish and Muslim authority food standards. As Hypuff is supplied in a sliced configuration, the slices of fat may tend to be difficult to separate when handled in unfavourable conditions eg. excess pressure or temperature. Do not stack more than five high. Do not store above 20C.